Imagine yourself in the 18th century. You are in this picture. Now imagine yourself in the world today. Are you still able to relate to the picture? Explore the following website to become familiar with groups of people that went through a similar experience. After students have been introduced to the Native Americans of the Pacific Northwest, create a KWL chart as a whole class. K - What do students already know? What information/prior knowledge are students bringing to this project? W - What questions do students have about the topic? What would students like to know about the Native Americans of the Pacific Northwest? L - What have students learned about the topic? Students will create a concept map with the help of the website about Native Americans of the Pacific Northwest. What was the way of life for Native Americans of the Pacific Northwest before the arrival of settlers and the adaptations that came with them? What predictions can be made about the progression of Native American adaptations for the future? There might be a list of sub-questions that will be asked as well. These questions will guide students in the direction of asking and answering the main questions. What types of environment did the Native American people inhabit? How did they survive in their particular surroundings? Do you think the Native American people wanted to change their way life? Why or why not? Students will use the Native Americans of the Pacific Northwest Digital Collection to view and examine photographs. As a whole class, students will begin a KWL chart and add to it each day. This will brings students' attention to the topic of Native Americans of the Pacific Northwest and prepare them to research the data. In order to organize their findings, students will create a concept map using Inspiration. As a whole class, students will record their individual findings on a class KWL chart each day. On an individual basis, each student will create their own concept map. Observations from the photographs found in the digital collection will be collected and added to individual students' concept maps. Web Inquiry Projects use data/information other people have gathered and placed online. Part of the inquiry process is finding the needed information. Students will be provided the address to the website where they can search to find the data they need. Students will be viewing and examining the photographs in this digital collection in order to create their concept maps. Students will view and examine photographs showing lifestyles of the Native American people living in two separate regions, the Northwest Coast and the Plateau, of the Pacific Northwest. As students generate questions and gather information based on those questions, they will produce a concept map. The following is an example from a student's perspective of asking questions, gathering data, and organizing that data in a concept map. As I analyzed this resource, I created a concept map showing the differences between the two cultural areas of the Northwest Coast and the Plateau. Beginning with the first inquiry question: What was the way of life for Native Americans of the Pacific Northwest before the arrival of settlers and the adaptations that came with them?, it was logical for me to focus on the part of the question regarding the life of the Native Americans before the arrival of settlers. Since the digital resource I am examining has been categorized, I am looking at those particular categories (e.g. work, transportation, dwellings, etc.) and exploring certain photographs of the two cultural areas of the Northwest Coast and the Plateau. I am able to deduce from these photographs the way of life of Native Americans before the arrival of settlers and organize my deductions in a concept map. I place the question: What was the way of life for Native Americans living on the Northwest Coast before the arrival of settlers? under the heading of Northwest Coast on my concept map and begin to add possible answers to it as I look at photographs. 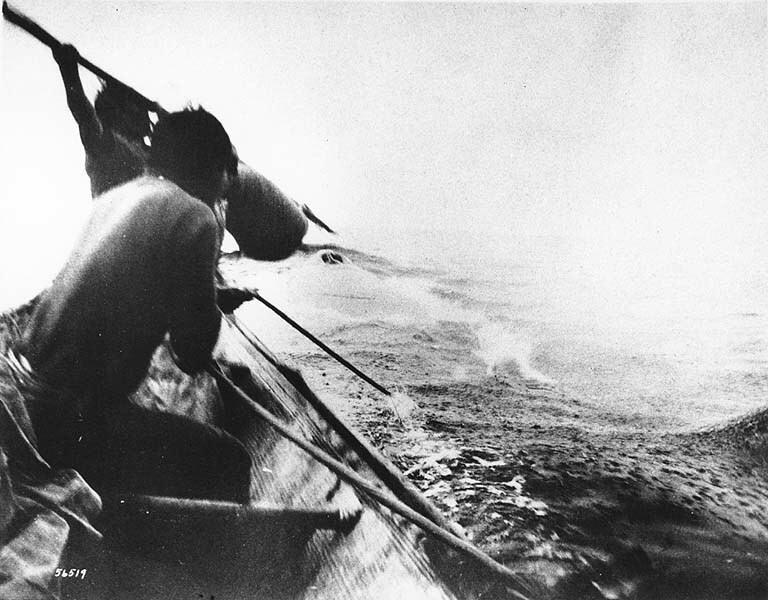 For example, while looking at the photograph of the man trapping a whale, I can see that people living on the Northwest Coast probably fished in order to provide food. They fished with weapons they made themselves from the resources found in their environment. On my concept map I add fished for food. Looking at the same photograph, and knowing that they lived on the coast, I can also say that they used canoes as a mode of transportation. I add used canoes for transportation under the same question. Another photograph I am looking at shows a family. This is probably an extended family because of the various age representations between the family members and the number of people standing together. They considered family to be very important in their lives and possibly lived together, or in close proximity of each other. I add lived with their extended family to my concept map. I continue this process of looking at photographs and making additions to my concept map. Under the Plateau heading, I place the question: What was the way of life for Native Americans living on the Plateau before the arrival of settlers? and begin to add possible answers to my concept map. For example, while looking at the photograph of a farmer plowing his field, I can assume that these people grew their own food. On my concept map I add grew own food. Another photograph I am looking at shows a row of tepees. I add lived in tepees on my concept map. I come across a photograph of a person wearing a ceremonial dress and a headdress. This was their attire for special occasions according to the type of decorations shown on the dress. I add wore ceremonial dress and headdress on my concept map. I continue this process of looking at photographs and making additions to my concept map. Click on the following concept map to see an example of its beginning stages. After having completed a concept map about the way of life of Native Americans prior to the arrival of settlers, I continue chronologically and ask questions regarding the adaptations that were made by Native Americans after the arrival of settlers. During the period of time that the photographs were taken, it is obvious that Native Americans had taken on many of the adaptations brought to them by the settlers. I continue to examine photographs of the two cultural areas of the Pacific Northwest and infer the type of adaptations made by the Native Americans. Referring to my previous concept map may help in concluding the types of adaptations made by Native Americans (e.g. Native Americans adapting the settlers’ attire). I continue to organize my findings in the concept map. Under the heading for Northwest Coast, I add the question: What adaptations were made by Native Americans living on the Northwest Coast? and add answers to my concept map. For example, while looking at a photograph of Native American people dressed in clothing that resembled the settlers’ clothing, I can make the assumption that the Native American people adapted the settlers’ way of dress. On my concept map I add began to wear western attire. Another photograph shows a group of houses and cabins, possibly a way of living in a village that was adapted from the settlers. I add inhabited houses and cabins in villages. I also see a photograph of younger Native American people standing outside of a church dressed in what looks like uniforms. These people are most likely receiving some type of an education from the church. I add educated in churches. I continue this process of looking at photographs and making additions to my concept map. Under the heading for Plateau, I add the question: What adaptations were made by Native Americans living on the Plateau? and add answers to it on my concept map. For example, while looking at the photograph of a ferry crossing a river, I can assume that Native American people adapted the use of the ferry for transportation across a river. On my concept map I add used ferries when crossing rivers. Another photograph shows a farmer using a plow in his field. The plow was probably introduced by the settlers to aid in cultivating the fields. I add used plows when farming. I see another photograph of Native American people in uniforms learning some type of a trade or life skill. These people are most likely being educated to be able to adapt to the settlers’ way of life. I add education focused on acquiring life skills. I continue this process of looking at photographs and making additions to my concept map. Click on the following concept map to see an example. After having answered questions about Native Americans concerning their past and present situations, I continue working chronologically and extend my knowledge of Native Americans of the Pacific Northwest to reflect on their future. The second inquiry question, What predictions can be made about the progression of Native American adaptations for the future?, will help me focus on my previous findings of Native American life prior to and after the arrival of settlers and predict adaptations that will remain and progress in the future. With the help of the information in my concept map, as well as ongoing examinations of the photographs, I record my predictions in my concept map. I place the question: What adaptations will be made by Native Americans living on the Northwest Coast as they progress into the future? under the heading of Northwest Coast and begin to add predictions to my concept map. For example, by referring to my concept map and noticing that Native American people made wood carvings and began to sell them once the settlers arrived, I am able to make a prediction about the progression of producing and selling such hand-made products in future stores. On my concept map I add stores selling hand-made products. Another prediction I am able to make is from the photograph that shows the church as the source of education. This adaptation of receiving formal education will eventually move from the church to actual schools specializing in education of some sort. I predict that Native American people will continue receiving education by attending schools, rather than churches, in the future. I add education in schools. Under the Plateau heading, I place the question: What adaptations will be made by Native Americans living on the Plateau as they progress into the future? and begin to add predictions to my concept map. For example, by referring to my concept map and noticing that the Native American people grew their own food and adapted the use of a plow for farming, I can make the prediction that they will continue this progression in farming by beginning to use modern farming equipment in the future. On my concept map I add use of modern farming techniques and equipment. Another prediction I am able to make is from the photographs of Native American people riding horses. Horses were used for transportation, but as the Native American people progress into the future, they will begin to use carriages and buggies that are pulled by the horses. This will allow them to travel with more people. I add use of horse-drawn wagons, carriages, and buggies. Click on the following concept map to see an example of its final stages. After having analyzed this digital resource and having created a fairly chronological concept map, students are able to make conclusions based on the information they gathered. Examining the differences between the way of life of Native Americans before, during, and after the arrival of settlers helps students understand the manner in which these people had to adapt to their changing environment. It was not only the physical aspects of their environment that Native Americans had to adapt to, but also the arrival of people who were foreign to their environment. These foreign people brought with them their own definitions for the way of life, and either through force or interest, Native Americans began to take on these adaptations. Progressing from their traditional way of life to their more modern and western way of life, Native Americans have successfully adapted to their surrounding environment while still keeping those customs they deem sacred. Students will complete the class KWL chart by referring to the data they collected and organized onto their concept maps. Students will then share their project with the class through a presentation that utilizes their creativity. Students can present their concept maps and their findings through a poster, use of the overhead projector, or a power point presentation. Students will reflect on the project by writing about the most interesting thing they learned about, or found, while examining the digital collection. What was the general consensus among the Native American people when their own people began to adapt their way of life to that of the settlers'? How were the lives of those that adapted to the new way of life affected? How were the lives of those that did not adapt affected?